Some Buddhist monks visiting the Bayon temple. Built in its present form about 100 years after Angkor Wat, the Buddhist Bayon temple is strikingly different than just about any other temple around Angkor. Its mountain-like structure is topped by 54 towers, each sporting four faces like the city's entrance gates. Although it might sound repetitive, each of the faces is slightly different. 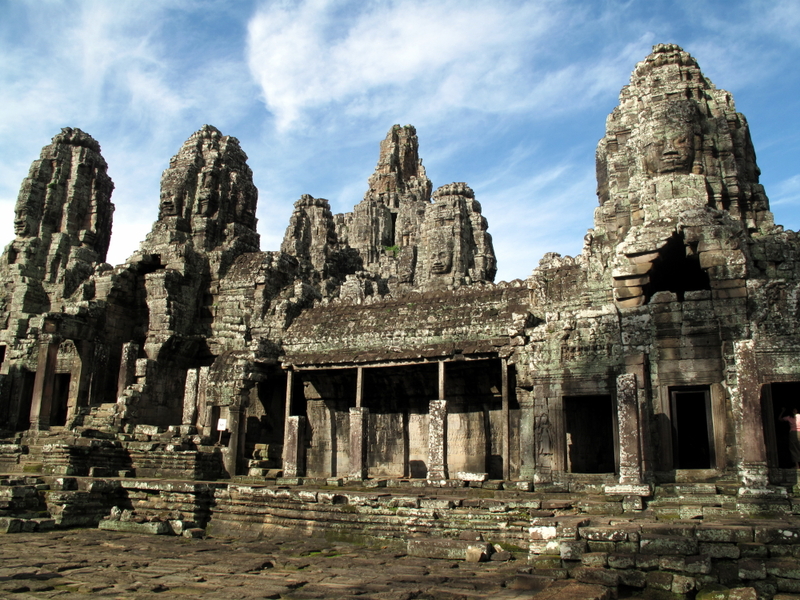 Zhou Daguan, a Chinese emissary, describes the central tower of the Bayon as being gilt. The temple was reached on the eastern side by a golden bridge guarded by lions of gold. Eight golden Buddhas were housed in chambers around the central tower. Zhou Daguan was not actually allowed to enter the royal city, so his accounts are not always to be believed. The meaning of the Bayon remains something of a mystery to this day. It is known that the temple was built on the remains of an older structure, and that it underwent many changes in the years after it was built. The temple was built by the great builder king Jayavarman VII when he made the Bayon his state temple at the center of his royal city, Angkor Thom. 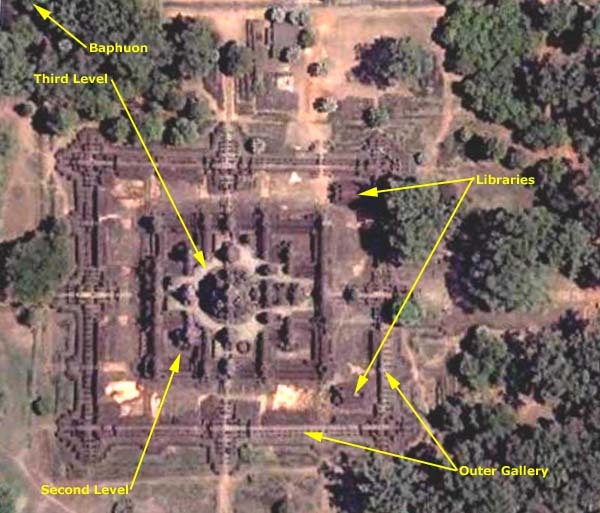 In fact, some people think that Jayavarman VII is the 'model' on whose features the many faces of the Bayon are based. 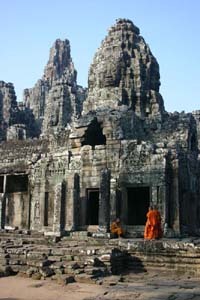 The Bayon is built on three levels. As at Angkor Wat, the gallery enclosing the first level is lined with bas-relief carvings, which are quite beautiful and more instructive that the ones at the great temple. The reliefs at the Bayon picture scenes from everyday life, such as markets, games and even childbirth. The third level is where you can get up close and personal with the faces. Everywhere you look you will have at least two or three in your line of sight. The central tower is huge, but somewhat hard to understand, since it is quite ruined. It's hard to imagine Zhou Daguan's golden spire.